Kentucky bluegrasses, Ryegrasses, Fine leafed fescues and Tall fescues are the grasses used for Cool Season grass lawns. a. Each one of the grasses above have their pros and cons regarding color, growth habit, disease resistance, wear tolerance, insect susceptibility, establishment rate & etc. Kentucky bluegrasses, Ryegrasses and Tall fescues do best in full sun and sun and shade lawns. Fine leafed fescues should be used in the shade. Only use annual ryegrass when combined with perennial grasses to get quick soil stabilization from the annual ryegrass and then long term life from the rest of the grasses that take longer to germinate. When seeding cool season grasses; using a mixture of Kentucky bluegrass and Ryegrass is recommended due to the compatibility of those grass types producing a lawn that has genetic diversity regarding disease resistance, color and growth habit. Ryegrasses when seeded will germinate in 7-10 days when kept constantly moist with soil temperatures over 65 degrees F. Therefore ryegrasses are good to include with any seeding to stabilize bare soil from erosion more quickly than Kentucky bluegrasses that take 2-3 weeks to germinate. Ryegrasses have a shiny leaf surface while Kentucky bluegrass has does not. Some people do not like the shiny look of ryegrass. Ryegrasses growth habit is a clump per plant which can cause a clumpy somewhat uneven surface if planted as a 100% stand of turf in a lawn. a. Combining Kentucky bluegrass and/or Fine leafed fescues with ryegrass when seeding will produce a smoother more even and less shiny looking lawn. 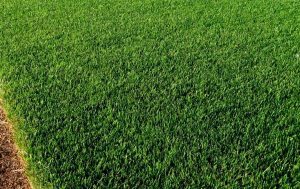 Mixtures and blends of different varieties and types of lawn grasses are available in garden and hardware stores already prepackaged. Look on the label to see what % of each grass type is contained in the different packages being sold. SavaLawn seed mixtures used on our lawns is also available to you. You get what you pay for with grass seed. Usually, the more you pay per pound the better the quality of seed you will get. Keep in mind that if you establish grass properly and take care of it, it will last for 30+ years. So, invest in the best up front and get a blend of different grass types unless you want a pure Kentucky bluegrass lawn…just like what most sodded lawns are. In the South where southern grasses go dormant, perennial ryegrass is over seeded in the fall to germinate and grow in the winter when the southern grasses go dormant and brown for the winter season. The ryegrass provides green grass over the winter and dies the following season when the southern grass greens up.